Oklahoma opens their season on Friday at the Northern Illinois University tournament: Stenberg’s alma mater. COLLEGE STATION, Texas – Former three-time SEC Libero of the Year Ashley Dusek has been added to the Texas A&M volleyball staff as a volunteer assistant coach, head coach Laura “Bird” Kuhn announced today. 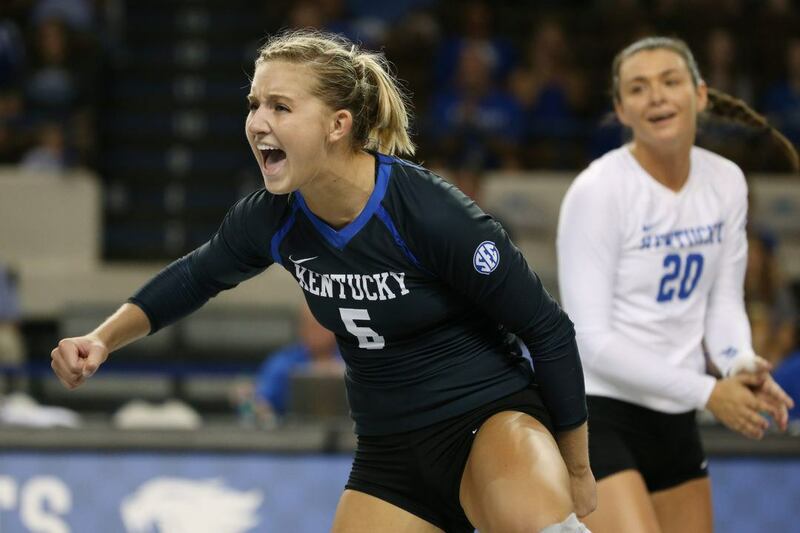 Dusek (pronounced DOO-sheck), also a three-time AVCA Honorable Mention All-America selection, was the cornerstone of the Kentucky Wildcats’ back row defense and finished her stellar four-year career with 1,574 digs. As a senior, the East Bernard, Texas, resident averaged 4.35 digs per set for the full season and 4.68 digs per set in Southeastern Conference matches while leading Kentucky to a share of the 2017 SEC championship, the NCAA Tournament regional finals and a No. 6 final ranking, the program’s highest final ranking since a school-record No. 5 listing in 1983. “Ashley has a special niche for the intangibles and knowing how to connect with people, and this seems like a perfect fit,” Kuhn said. “She loves training and playing at a high level, and she is a fierce competitor who also has that flip side in which she can connect with people, motivate them and be there for them. Dusek, who was a finalist for the 2017 Senior CLASS Award, a national award that encourages students to use their platform in athletics to make a positive impact as leaders in their communities, graduated from Kentucky in May with a degree in integrated strategic communications with a minor in digital and media arts. “I love talking about the sport, being involved with the sport and teaching the sport,” Dusek said. “I’ve been a player my entire life and I want to coach at the college level, so this is a chance to get my foot in the door and see how it is on the other side. Dusek will make her first appearance on the Aggies’ sideline on Saturday, August 18 when Texas A&M plays host to TCU in an exhibition match at Reed Arena. First serve is at 1 p.m., and admission is free. Texas A&M opens the regular season against Ohio University on August 24 at the Sports Imports D.C. Koehl Classic in Columbus, Ohio. The Aggies make their official Reed Arena debut on Thursday, Sept. 6, as they host the two-day Texas A&M Invitational. Season and single match tickets are on sale at 12thMan.com.